There are many wonderful things about living out in the country. Beautiful views. Peace and quiet. Seeing the stars at night. There are some not so great things about living in the country. No place to just grab a gallon of milk…or a box of Hot Tamales. Cows wandering through your yard. Yes. Yes they do. And no Anthropologie. Which makes it hard when you start coveting the cute little chalkboard spice jars everyone starts posting on Pinterest and Instagram and Facebook. Since these little suckers are pricey enough all on their own, there was no way I was going to order them online and add shipping costs to the already hefty little price tag. So, I decided to see if I could make a knock-off version. Spray several light coats of White Dual Primer & Paint Spray paint on jars until thoroughly covered. Allow to Dry. Brush on several light coats of chalkboard paint onto labels, allowing to dry thoroughly between coats. (If desired) Apply pattern to lids using Elmer’s glue and allow to dry thoroughly. With acrylic paint of choice, paint each lid with several light coats of paint until desired coverage. 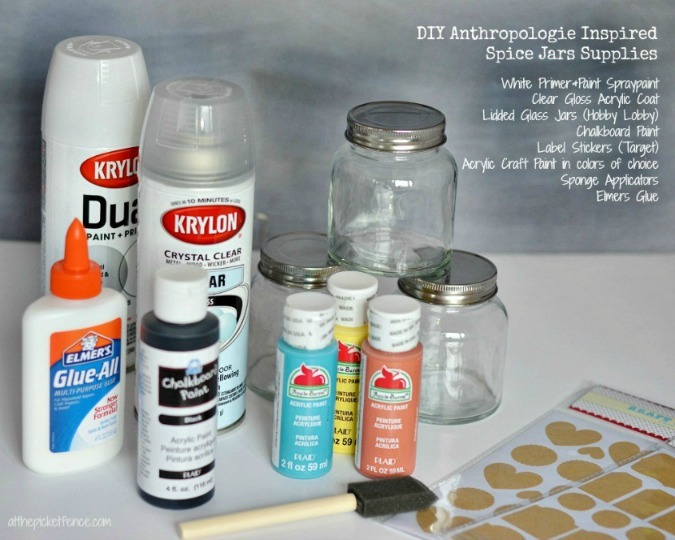 Spray jars and lids with light coat of acrylic spray paint and allow to dry thoroughly. 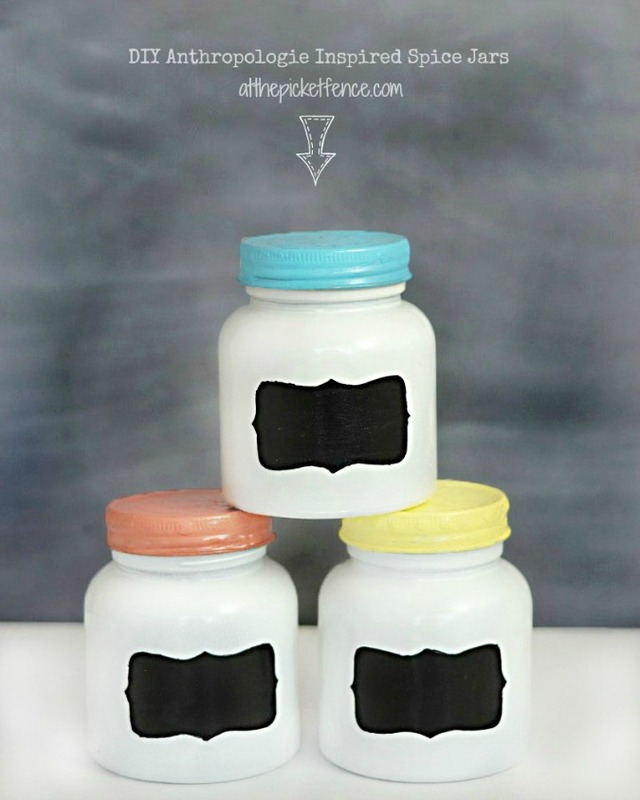 Attach chalkboard labels to jars. Use glue if necessary for a stronger adhesion. I really love how they turned out! I probably will stick to using them for odd and ends and not actually spices…but I think they are just so cute! Stay tuned because we have tons of fun spring ideas coming up over the next few weeks. 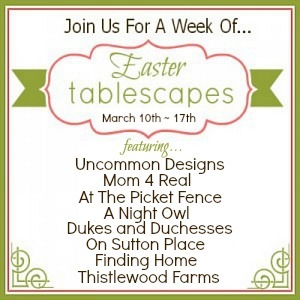 Like this great Easter Tablescape Party we’ll be participating in with a group of fabulous bloggers! See you back here soon….at the picket fence. 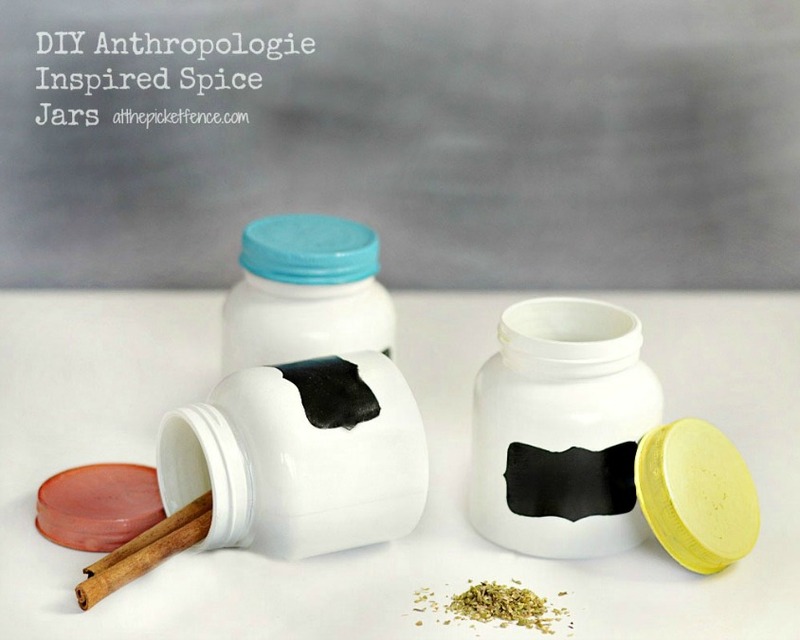 45 Comments on "Make your own Anthropologie Inspired Spice Jars"
Those are so darn cute. I love the different color lids and the chalk board tags. Awesome knock off project. These are amazing. And that trick for painting the labels is brilliant. I tried using chalkboard paint directly on glass once, and it eas a huge fail. And now I have another reason to like you. Hot Tamales! Best candy ever. Email me your address and I will send you a care package! ha! YES! People know they can bribe me for favor with a box of Hot Tamales. 😉 lol I found painting the chalkboard paint straight onto glass a failure as well, I think these provided a much cleaner look. I’m saving baby food jars. Either collect them from friends or buy them on sale. I plan to attach a magnetic sheet under my cabinet (I have very little counter space) then “hang” the jars from the sheet. the lids also have a vinyl seal to maintain freshness. I love your idea. when I first saw the jars I thought, “that’s the same idea I had!” In comparison to the jars I’ve looked at, the baby food jars are the perfect size and price. This is genius – thank you! I adore your little jars! I can’t believe your amazing, creative skills in making the top of the lid design! WOW! LOVE the idea of the Elmer’s Glue for a design on top! SO cute!! Nothing like a good anthro knockoff! Plus there’s nothing better than chalkboard anything in my humble opinion! Ummmm these are AMAZING! I am so excited that there is a way to make these versus buy them! Oh my goodness I am SO inspired! Thank you so much for sharing! Found this post and your blog at the Inspiration Gallery. This is such a cute knockoff! I would love to try something like this…but I would actually want to use it for spices. It doesn’t look like you sprayed the inside, but you still think it might be better to keep this for non-food storage?!??!?! I have been saving up empty spice jars recently. What a great idea for them! Especially considering it’s much cheaper to buy spices in a sachet rather than the jar too. Saves some money while crafting! Always a great thing! I just got a bag of empty spice jars from my MIL’s storage. Apparently, she and I did have one thing in common. She liked to hoard used jars and stuff too. I’m planning to remake mine so thanks for the inspiration. I really do like yours. You go girl! I LOVE these spice jars! I bought the ones from Anthro….but yours are cuter! Thanks so much for an amazing tutorial. Wow that is so pretty. I really like them. Oh LOVE LOVE this and I have a few of those exact jars….I see this in my future!! Thanks for the great tutorial! AWESOME DIY! i’ve seen similar jars at Target and today I even saw a version at Michaels. I LOVE yours! 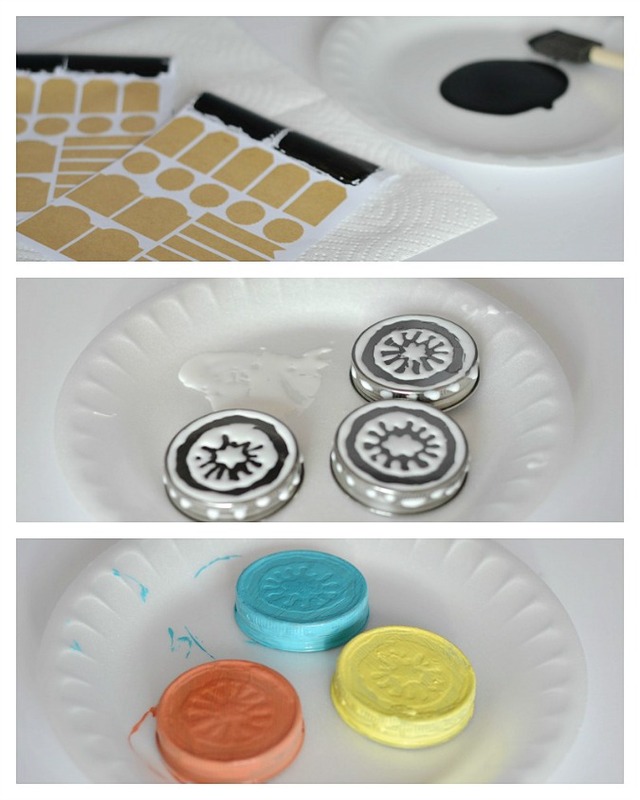 Really great DIY and they look just like the inspiration. I love the top detail. Sweet! Ahhh…those are just too cute. I have to look for those labels. I think my Mom may have bought some for my sisters wedding. I am going to ask her. I love Anthro too, but ours is far and I don’t get there often. These are so cute! They could be used for so many things, too. Wouldn’t they look adorable lined up on shelves in a craft room holding little buttons and baubles? I made knock-offs also and just thought I would share some alternate methods – I used plasti-dip for the jar tops and I used chalkboard contact paper for the labels rather than painting a label. And, if you should have a Target near you the jars are much cheaper to buy than to buy the materials lol. Yours look great!! These jars are so cute! I love that Anthropologie things can be re-created at home for SO much less! I’m hosting a “Craft With What You’ve Got” party tomorrow and the featured crafting supply for this week is craft paints. Your spice jars would fit in perfectly! I’d love for you to link it up here. I Love these! Thanks so much for posting. table tennies guide Amal Raj of PSPB in finals. this blog iis actually amazing. youu center ylurself andd clear your mind prior to writing. I have had trouble clearing my miind in getting my ideas out. to 15 minutes tend to be loxt just trying to fiugure out hoow to begin. Any recommendations or tips? Love the jars. I have some old baby food jars I’ll be looking for and that makes them even more affordable. You can so diy hot tamales. Just takes a bit longer. It’s a fun project especially on a cold, rainy day! I’ll be sending along a delicious biscuit recipe.